As many of you know, back in May, I decided to give something new a try. With this step, I subscribed to this fantastic service called Cuisine Cube. With Cuisine Cube, you receive 5-6 gluten-free products from small and/or local businesses…those products and companies that you won’t find at your local grocery store. It’s amazing the food that I have discovered. And, the cube is generally well-rounded in that it includes an item for breakfast, lunch, snack, dinner and dessert. And then, sometimes…a bonus! And this service starts at $29.99, depending on how frequently you want this box of goodness delivered to your door. If you’ve been reading about it in my blog and putting it off, hesitant to try something like this out…just take action. I promise, you will not regret this purchase. That being said, my life has been really busy as of late with so much traveling going on. I feel like I am rarely ever home. However, these past few weeks have given me the opportunity to work through some of the products from previous Cuisine Cubes that I didn’t have the chance to get to before. This has been quite an amazing couple of weeks. Who likes potato chips? Plain? Sweet potato? Lightly salted? Barbeque? You name it…but there is something so addictive and amazing about potato chips. From their light feel to their crispy and salty texture. Mmmm. They are the ultimate pig-out snack. And by that, I mean if you eat out of a bag, sometimes it is really hard to stop…and before you know it…the entire bag is gone. We’ve all been there and done that. Don’t worry…we’re human…and that’s normal. This is also why I do not ever eat out of a package anymore. I portion out things I could mindlessly eat…such as chips. Back in October, when they mailed off the Non-GMO Project box, Cuisine Cube included a bag of Hardbite Handcrafted Lightly Salted Parsnip Chips, with the grand title of “Eat Your Parsnips.” I love chips made from parsnips. I often find gluten-free variety chip bags (like with beet chips, sweet potato chips, parsnip chips, and regular potato chips) and have always loved the little bit of extra flavor that parsnips bring to those mixes. But this bag…this bag was dedicated to the often misunderstood parsnip. If you are unfamiliar with what a parsnip is…it is a root vegetable…resembling a cream-colored carrot. In fact…this vegetable is sort of a cross between a carrot and a potato, if that tells you anything. What the people at Hardbite did was reinvent the parsnip by turning it into a light and crunchy snack. I mean…who doesn’t like potato chips, right? Well, a parsnip is different from a potato. It’s sweeter, for one thing. And that’s the first thing I noticed when I took my first bite into one of these long, lightly salted chips. The sweetness does take a moment to get used to, but, thankfully, the lightly salted exterior helps to tame it. Salty and sweet. Who doesn’t love that? In addition, these chips definitely bring the crunch factor. From a company that calls themselves “Hardbite,” I would expect nothing less. And, let’s be honest…it just sounds so much healthier to eat chips made from parsnips than from potatoes, yes? I mean, our starchy potatoes are amazing and wonderful…but they do get a bad rap. If you are a fan of light chips with a big crunch and a sweet and salty flavor…these are definitely for you. Hardbite was founded by a potato farmer based out of British Columbia. In fact, this is the only potato chip manufacturing plant based out of British Columbia. It was founded 12 years ago when, Pete Schouten, the owner, founder, and a farmer was on a quest to perfect the potato chip. I know that doesn’t sound like much of a quest, but it was enough to get Schouten to start up Hardbite Potato Chips. When the opportunity arose, he grabbed at it and became an owner in this local company. It all started with a single frier and a desire to make the very best chip on the market. Hardbite is picky about what goes into their chips and make their chips with ingredients that are free from GMOs, trans fat, gluten and cholesterol. They use the finest and freshest ingredients and dress their different flavored chips with aromatic, natural seasonings. All chips are cooked in small batches to give Hardbite chips that defining crunch. The Hardbite product line now consists of seven unique flavors for all snacking occasions! Let’s talk ingredients. 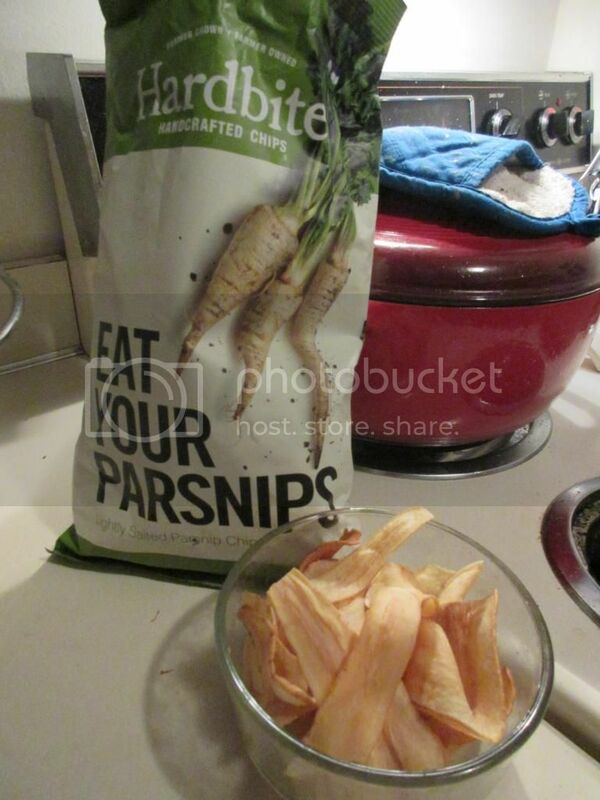 The bag of Eat Your Parsnips…also known as Hardbite Handcrafted Lightly Salted Parsnip Chips…is made from parsnips, non-hydrogenated sunflower oil and/or non-hydrogenated canola oil, sea salt. Yes…that is really it as far as ingredients go. Three ingredients…big flavor. As far as nutrition goes, a serving of Hardbite Handcrafted Lightly Salted Parsnip Chips is 28 grams (or about 16 chips). This serving will provide you with 120 calories and 13 grams of fat. In addition you will be consuming a light 105 mg sodium and only 1 gram of sugar. Finally, these chips give you 1 gram of fiber and less than 1 gram of protein. Not filling, but chips never are. They do make for a nice snack though in between meals…or paired with a veggie burger or sandwich, for sure. Real ingredients…real attention to what goes into their food. This Canadian made chip is a healthy and great alternative to the standard potato chip. They can be a little sweet, but if you like that sort of thing, you will definitely fall in love with these chips. And if you are a sucker for a crunch…these definitely bring it. Yet another brand I never would have even known about or tried if not for Cuisine Cube. Because of this monthly service, products like these chips from Hardbite, make their way to my kitchen and then…I can go and find out how to get more if they strike my fancy. Great service. Great products. Great food. Thank you, Cuisine Cube! This entry was posted in Chips, Clean Eating, Cuisine Cube, Food, Gluten-Free, Potatoes, Products, Review, Side Dish, Snacks, Sweet Stuff, Vegan, Vegetables, Vegetarian by The Celiathlete. Bookmark the permalink.